Fifty-six percent of Americans say the use of marijuana should be legal - a new high, and a slight increase from a year ago. Now just 36 percent think it should not be legal, down seven points from last year. Public opinion on legalizing pot has changed dramatically over the years. In 1979, just 27 percent said marijuana use should be legal. As recently as 2011, a slight majority of Americans opposed legalized marijuana use. A majority of men continues to favor marijuana legalization (59 percent), and now most women favor it as well (54 percent). Most Americans under 65 support legal marijuana use, particularly younger adults: 71 percent of adults under 35 think marijuana use should be legal, a jump of 10 points since last year. Older Americans tend to think differently: Just 31 percent of Americans 65 and over think marijuana use should be legal. There are partisan differences too. Most Democrats and independents think marijuana use should be legal, while most Republicans do not. Support among independents for legalized marijuana use has risen seven points since last year. There is even greater support for allowing doctors to prescribe small amounts of marijuana for patients suffering from serious illnesses: nearly nine in 10 think this should be allowed. Marijuana use remains illegal under federal law, though a majority of Americans don't think this is a matter that should involve the federal government. Six in 10 think legalizing marijuana should be left up to each state government to decide rather than be decided by the federal government. The percentage of Americans who say they have personally tried marijuana has risen sharply over the past twenty years, and it has jumped eight points since just last year. 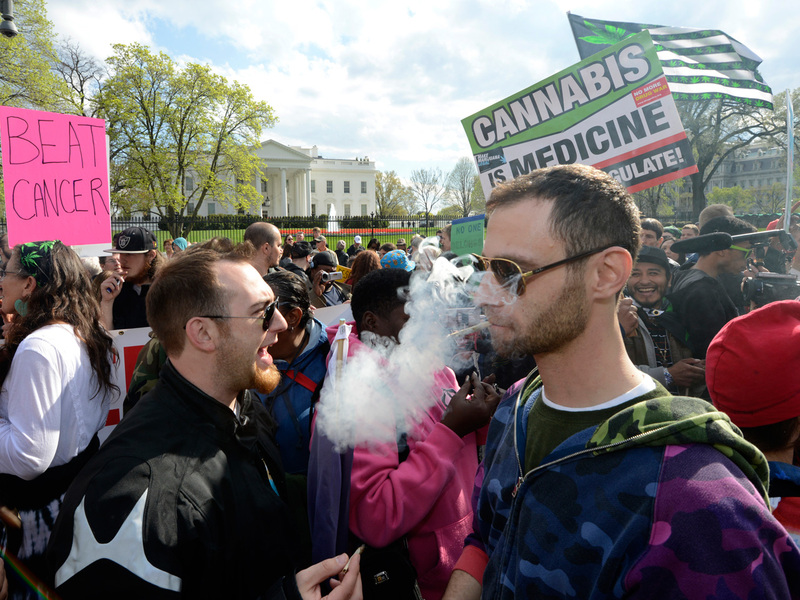 51 percent of Americans say they have tried marijuana, up from 43 percent a year ago. Most men and most Americans under 65 have tried marijuana, while most women and most seniors have not. Fifty-two percent of Americans view marijuana as safer than alcohol; just 9 percent thinks it is more harmful. 27 percent volunteer that both are equally harmful, while 9 percent pick neither. Sixty-eight percent of Americans who have tried marijuana think alcohol is more harmful, while those who have not are more likely to think they are equally harmful. The issue of legalizing marijuana doesn't seem to matter much in how Americans might cast their vote for president. Six in 10 Americans say it wouldn't matter if a presidential candidate supported legalizing marijuana use, including most Republicans, Democrats, and independents. Of those who say it would matter, Republicans are more likely to oppose a candidate who supported marijuana use, while Democrats would be more likely to support that candidate. Independents are divided. Whether a candidate has used marijuana in the past matters even less: eight in 10 say it wouldn't make a difference if a presidential candidate had used marijuana, including large majorities of Republicans, Democrats, and independents. This poll was conducted by telephone April 8-12, 2016 among a random sample of 1,020 adults nationwide. Data collection was conducted on behalf of CBS News by SSRS of Media, PA. Phone numbers were dialed from samples of both standard land-line and cell phones.